The Camuy Cave Park in Puerto Rico is one of the island’s most fascinating attractions. Its 268-acre park features numerous subterranean caverns which were formed millions of years ago by the Camuy River. The caves can be reached by trails which take you down a couple of hundred feet to the breathtaking underground waterways, canyons and caverns where you’ll also be able to see schools of colorful and unique fish. In fact, the cave system is the third largest in the world. There’s a network that consists of 16 limestone caves which stretches for approximately nine miles. Along the way you’ll find several picnic areas, hiking trails and cafes along with a children’s play area, exhibition hall and souvenir shop. As a bonus, there’s also a campground in the park which enables you to stay overnight to soak in the fantastic atmosphere and scenery. When you reach the caves prepare yourself for some amazing views as well as some colourful and dense tropical vegetation. There are guides on hand who’ll describe the views in front of you and give you the park’s interesting history. To enjoy the trip back in time all you need to do is put on your harness, life jacket and lamped hard hat. There’s an open-aired tram which will transport you across ramps and bridges which lead you to the Cueva Clara. This cave is illuminated and is close to 170 feet in height. 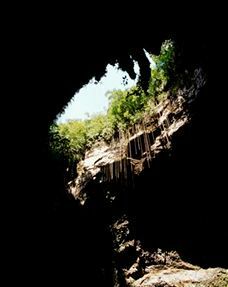 Another tremendous sight is the Tres Pueblos Sinkhole as it sits 650 feet in width and 400 feet in depth. You’ll also see walls which the Taino Indians carved petroglyphs into hundreds of years ago. When camping in the park you’ll be able to explore the caves between 8am and 5pm. However, if it’s raining, they might not be accessible since the river sometimes rises and floods. Be aware that the park caps visitors at 1,500 each day. The tours are available in both Spanish and English and there’s a film which describes the river and cave system. While the caves were formed millions of years ago, they were only discovered during the 20th century and the park opened in 1987. The assortment of stalagmites, stalactites and rock formations will amaze you as will the crystal clear waters and their ancient fossils.